This document is a technical summary of the Federal Highway Administration report, Alternative Intersections/Interchanges: Information Report (AIIR) (FHWA-HRT-09-060). Today's transportation professionals, with limited resources available to them, are challenged to meet the mobility needs of an increasing population. At many highway junctions, congestion continues to worsen, and drivers, pedestrians, and bicyclists experience increasing delays and heightened exposure to risk. Today's traffic volumes and travel demands often lead to safety problems that are too complex for conventional interchange designs to properly handle. Consequently, more engineers are considering various innovative treatments as they seek solutions to these complex problems. The corresponding technical report, Alternative Intersections/Interchanges: Informational Report (AIIR) (FHWA-HRT-09-060), covers four intersection designs and two interchange designs that offer substantial advantages over conventional at-grade intersections and grade-separated diamond interchanges. The AIIR provides information on each alternative treatment covering salient geometric design features, operational and safety issues, access management, costs, construction sequencing, environmental benefits, and applicability. 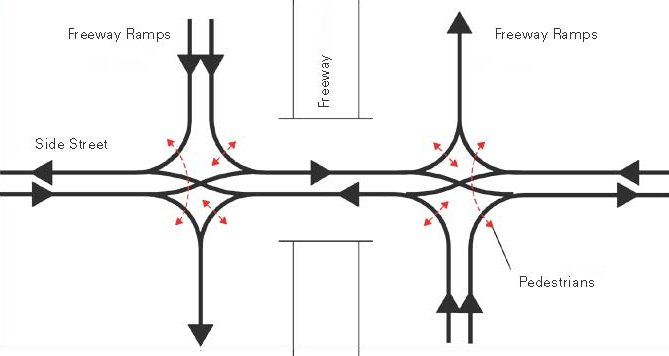 This TechBrief summarizes information on one alternative interchange design—the double crossover diamond (DCD) interchange (see figure 1). Figure 1. Photo. First U.S. DCD interchange at I-44 and Route 13 in Springfield, MO. The DCD interchange, also known as a diverging diamond interchange (DDI), is a new interchange design that has much in common with the design of a conventional diamond interchange. The main difference between a DCD interchange and a conventional diamond interchange is in the way left and through movements navigate between the cross street intersections with ramps (see figure 2). The DCD design accommodates left-turning movements onto arterials and limited-access highways while eliminating the need for a left-turn signal phase at signalized ramp terminal intersections. On the cross street, the traffic moves to the left side of the roadway between the signalized ramp intersections. This allows drivers of vehicles on the cross street who want to turn left onto the ramps the chance to continue to the ramps without conflicting with opposing through traffic and without stopping. Highway A13 and RD 182 (Boulevard de Jardy) in Versailles, the intersection of Highway A4 (Boulevard des Allies) and Boulevard de Stalingrad in Le Perreux-sur-Marne, and the intersection of Highway A1 and Route d'Avelin in Seclin. In the United States, the first DCD interchange was completed in July 2009 in Springfield, MO, at the intersection of Route 13 and I-44(see figure 1). Several other DCD interchanges are being planned, including the intersection of I-435 and Front Street in Kansas City, MO. Figure 2. Illustration. Crossover movement in a DCD interchange. Left-turn and through movements are relocated to the opposite side of the road on the bridge structure. Turning radii used at the crossover junction are typically in the 150- to 300-ft range. Median width is increased to allow for the flaring required for reverse curves on the interchange approaches. The skew angle between the intersecting directions is closer to perpendicular when possible. Median openings are placed upstream of the interchange to allow U-turn movements on the arterial roadway. Pedestrian crossings are accommodated by installing crosswalks and signalization at the junctions or nodes of the interchange (see figure 3). The two-phase signal control possible in a DCD is more efficient for pedestrians, but it requires them to cross the junction in two stages with the central island serving as a refuge between signal phases. Additionally, pedestrians could have the option to walk in the median of the DCD interchange (implemented for the DCD interchange at the junction of I-44 and Route 13 in Springfield, MO). Figure 3. Illustration. Typical DCD interchange movements. A DCD interchange typically has two signalized junctions or nodes at the points of left-turn crossovers. The signals operate with just two phases, with each phase dedicated to the alternative opposing movements. The two-phase operation of a DCD interchange allows for shorter cycle lengths and reduced lost time per cycle compared to the three- or four-phase operation at conventional diamond interchanges. Signals on a DCD interchange may be fully actuated to minimize delay, and both signalized junctions can be operated using either one or two controllers. The traffic simulation software VISSIM was used to compare the operational performance of DCD interchanges to conventional diamond interchanges. Two DCD interchange designs and two conventional diamond interchange designs were simulated under high and low traffic volumes. At the higher traffic volume simulations, the DCD interchange demonstrated overall better performance. It had less delays, fewer stops, reduced stop times, and shorter queue lengths compared to the conventional design. Delays were reduced by 15 to 60 percent, and throughput was increased by 10 to 30 percent. However, at lower volumes, the performance of the DCD interchange and conventional diamond interchanges were similar. The simulation showed that service volumes of left-turn movements (650 vehicles per hour per lane (veh/h/lane)) could be twice that of the corresponding left-turn service volumes of a conventional diamond. An advantage of the DCD interchange over the conventional diamond is that exclusive left-turn lanes are not necessary for the DCD interchange. A DCD interchange has only 14 conflict points and two crossing points. In comparison, a conventional diamond interchange has 26 conflict points. 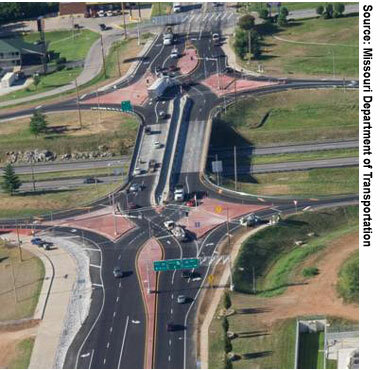 Missouri Department of Transportation designers noted that the DCD interchange geometry also has traffic calming features that reduce speeds while maintaining capacity. This is expected to result in fewer and less severe crashes than in a conventional intersection. They also noted that the shorter clearance distances on the DCD interchange ramps compared to an equivalent conventional diamond interchange could result in reduced vehicle exposure times within the intersection and thereby lead to improved safety. Another noted feature of a DCD interchange is that wrong-way movements onto ramps are eliminated. Heavy volumes of left turns onto freeway ramps. Moderate and unbalanced through volumes on bridge approaches on the arterial road. Moderate to very heavy off-ramp left-turn volumes. Limited bridge deck width availability. The DCD interchange offers benefits over conventional interchange designs with its efficient two-phase operation, narrower bridge structure width, lower costs, fewer conflict points, expected increase in throughput, reduced vehicular delay, decreased speeds, and reduced environmental impact. At this time, there is one existing DCD interchange site in the United States and three DCD interchanges in France. Other State transportation departments have initiated and planned the construction of several additional DCD interchanges. More details on DCD interchanges and other innovative intersection designs can be found in the full AIIR available from the Federal Highway Administration. Researchers—This study was performed by Principal Investigators Warren Hughes and Ram Jagannathan. For more information about this research, contact Joe Bared, FHWA Project Manager, HRDS-05 at (202) 493-3314, joe.bared@dot.gov. Distribution—This TechBrief is being distributed according to a standard distribution. Direct distribution is being made to the Divisions and Resource Center. Availability—This TechBrief may be obtained from the FHWA Product Distribution Center by e-mail to report.center@dot.gov, fax to (814) 239-2156, phone to (814) 239-1160, or online. Key Words—Diverging diamond interchange, DDI, Alternative interchange, Double crossover diamond, and DCD. Notice—This document is disseminated under the sponsorship of the U.S. Department of Transportation in the interest of information exchange. The U.S. Government assumes no liability for the use of the information contained in this document. The U.S. Government does not endorse products or manufacturers. Trademarks or manufacturers' names appear in this report only because they are considered essential to the objective of the document. Quality Assurance Statement—The Federal Highway Administration (FHWA) provides high-quality information to serve the Government, industry, and public in a manner that promotes public understanding. Standards and policies are used to ensure and maximize the quality, objectivity, utility, and integrity of its information. FHWA periodically reviews quality issues and adjusts its programs and processes to ensure continuous quality improvement.